The Pokémon Sun and Moon Special Demo Version has been keeping plenty of 3DS owners busy since its arrival, with a mini adventure of its own and plenty of items and an Ash-Greninja to claim; these will be transferrable to the full game. One thing the demo is doing to keep players coming back is giving away special items after set numbers of days - it's based on calendar days from the point you first play it. For those that picked this up when it launched on 18th October, the first extra is available. A man by the Pokémon Centre should be waiting and will offer you 10 Pretty Wings for your trouble. More 'events' are due 5, 12, 18 and 24 days after the initial play of the demo. It'll be interesting to see what comes next. What is a pretty wing, exactly? @alasdair91 Unfortunately, it's an item that does absolutely nothing, and only exists to be sold, at $100 each. Not that great of a reward, but at least you get a solid $1000 out of the ten you get! @alasdair91 A pretty... wing... isn't clear? I have to do some spring cleaning on my 3DS card first. I want to try it though. In Black/White, when crossing a bridge such as Driftveil Drawbridge you had a chance to see a flying Pokémon spot. Walking into the spot would either trigger an encounter with a Ducklett, acquire a Wing item that can boost an EV by one point, or a Pretty Wing which has no effect, but can be sold for a little cash. They're duds though, as the EV boosting Wings sell for 15 times as much as the Pretty Wings. Only downloaded the demo today so won´t be able to claim anything yet. Although it sounds like i´m not missing much. @0muros Have in mind the person probably don't know much about pokemon. Perhaps they asked if the item has some use in games. Interesting marketing. I played it yesterday for about 2 hours right after it was available in NA, and then felt done. Now I have a reason to go back and that will keep it in the consciousness until launch. Smart. Exactly what am I supposed to do now? I defeated the "three trainers" Ace Trainer, I upgraded my "bond" with Tauros, whatever that means... and now? 10 Pretty Wings ?...no way, I won't be bribed to play your demo..
@AlexSora89 There's the Pokémon catching minigame, but that's the only thing that gets you transfer items. Well, and the rewards mentioned here. I'm cool with whatever they give us. I'm just glad I won't be completely poor when the full game comes out. @hieveryone Did anything in the many trailers they released interest you? Or better yet did you try the demo? If so, then go for it. Giving out pretty wings? THANKS, M.A. LARSON! Oh wait, wrong fandom. Someone already uploaded all the timed events to YouTube. Strangely, a couple of them give no rewards. @AlexSora89 I'm currently at the catching challenge. Although I bet you've already done that since it's on the same hill. @ShadJV If I recall, I discovered a battle challenge (beat 3 trainers on the path to the trial & talk to ace trainer at the start for a battle & item) that gives you an item, and there's this one girl (opposite end of the map in town, northeast of docks) who will take you to a mountain path for you to use Tauros to clear. An interesting dude (who seems like a certain Zelda character) gives you an item there as well. One of those is a star piece...can't recall what the other was. But the star piece is traditionally a lot more valuable. Huh? I played the mountain trial and beat the Team Skull lady and it played a video and went back to the start screen as if that was it over so I stopped playing. On an unrelated note, what the heck is Ash Greninja about, and will other items get this strange evolution? @hieveryone A lot of people were turned off by Black& White, especially Black & White 2. X&Y were a breath of fresh air for some Omega Ruby/Alpha Sapphire were a return to form for others. I'd say Sun & Moon are worth a try... especially if it's your first time in a new 3D world. The main thing this demo made me notice is the big "turn off" a 3D map Pokémon is for me. I only played to Alpha among the "polygonal games" but it was using a traditional 2D view. It might look retrograde but thanks to this I never noticed how ugly every line is on the map. In Zun/Moon (probably XY too), you're so close to the objects than you can count the "créneaux" resulting from the aliasing on everything. I wasn't even allowed to hold on to my new Rockruffs & Pikapals! *reeeaaally not fond of the new generation's art style overall. Anybody want my (NA)Volcanion code? @Serelynn can you give me the code please? You get a Balm Mushroom for talking to the guy with the Pikachu. The Unova games (Pokemon Black,Black 2,White and White 2) were all WAAAAAAY heavier in story plot and in game interaction and events!!! X and Y was really just good for it's graphics. There is HARDLY anything extra to do in Pokemon X/Y. That ONE single battle area/Battle Maison is NOT a good count for battle experience! Pokemon Omega Ruby/Alpha Sapphire were quite dull too!! 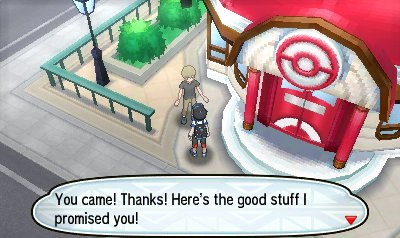 Not a SINGLE thing that Emerald did to boost the Hoenn experience was added. A PROPER testament to the gen 2 games!!! In my books....Pokemon Omega Ruby/Apha Sapphire are NOT proper testaments to all that is Hoenn!! @MrPokemon907 NOPE!!! Pokémon B2&W2 were uninspire rehashes of the first Black & White with the same characters, similar story and the same old tired graphics and NOTHING new in the way of mechanics or story elements. It's "WAAAAY" heavier in story? You mean an evil team of trainers try to take over to world by stealing pokémon & using ONE powerful pokémon to cause catastrophe? That's the plot of EVERY pokémon from RBY onwards but without ANY new characters or pokémon to show for it. It's a real boring slogfest to get through... one of my friends literally POSTED his copy to me so I could finish it FOR him. As for Omega Ruby & Alpha Sapphire.. you obviously haven't played/got closed to completing it as there is a TONNE of new story added into it both before & after the main plot. It's confirmed to be in a different dimension to the original Ruby & Sapphire? There is an asteroid headed towards to planet ready to destroy it? You have a new protagonist in the shape of the descendent of Pokémon talkers? Plus you have completely NEW version of Pokémon Contests, something which were a massive hit the first time around & are completely rebuilt for ORAS. As for HeartGold SoulSilver, they were so boring I never bothered to complete them, to be fair I wasn't a fan of Gold or Silver to first time around. It's nice you have an opinion, but trying to assert your opinion as the only one & seemingly not played all of the games is a little egotistical.